We are the makers of My Merry Christmas, the world’s largest Christmas community online and the Internet’s oldest ongoing celebration of Christmas. You can read our story here. 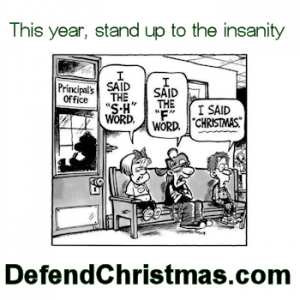 The so-called War on Christmas is really only a war in the sense that there are victims. And the victims of this war are people who take any extreme position relative to the season — either for or against it. That’s because Christmas really isn’t the point of contention some people make it out to be. It has been celebrated in different ways by different people in different cultures around the world since before the birth of Jesus Christ. We contend, if we must contend at all, that Christmas is special for that fact alone. The diversity of thought around the season needs to be celebrated — not condemned. Yet some choose to choose sides — and make a war of it. We don’t believe it. We’re not buying into it. And we’re tired of it. Christmas is celebrated for the sacred and the secular but nobody really fights over it. Not really. Over the years we have polled thousands of people on this issue and no matter where they come from, what they believe or how they celebrate Christmas they just don’t want fight about it. For more than a decade more than 95% of respondents declare they check out on the arguments of Christmas. That’s right, they don’t care. They just want to keep Christmas in whatever way they keep Christmas. So why create this website? Quite simply we’re declaring war on the war on Christmas. We’re going after those who create controversy every time they see a Nativity scene on public land — and we’re going after every zealous media outlet who would have us all think society is being robbed every time a school says the word “holiday” instead of “Christmas”. There is a middle ground in all this and most of us stand on it. These are the people this site represents. The manufactured “war on Christmas” is a non-event. Those who celebrate Christmas it do so with good cheer — and good will — in their hearts, whether they view that as a religious thing or no. And those who do not keep Christmas let those who do have their fun. That’s the majority opinion. And we’re here to promote it. What we’re against are those who use Christmas as a means to promote something else. Something like militant Atheism. Something like television cable news channels. Something like political candidates. Or something like zealots who just want their 15 minutes of fame. Find another way. Leave Christmas alone.